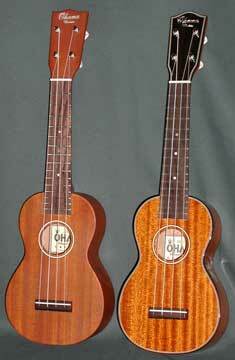 We discovered Ohana Ukuleles several winters ago when we attended a music industry trade show. There must have been 30 companies offering ukuleles, but we liked what we saw of Ohana ukes the best among the offerings of decent quality but modestly priced instruments. We’re impressed with their sound, solid construction and straightforward looks. We carry soprano, concert, tenor and baritone models featuring all solid mahogany as well as laminated mahogany models. Prices for all-solid wood models start at $159 (although we’re quite impressed with the more basic $69 SK-10S, $85 SK-14 and $119 SK-20S models, too).